The artworks of Bess Nungarrayi Price represent Mala Country to the north west of Yuendumu. Yuendumu is approximately 300kms to the North West of Alice Springs, NT. 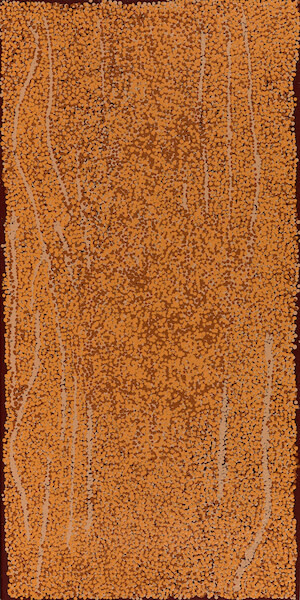 This dreaming belongs to the Japaljarri/Napaljarri, Jungarrayi/Nungarrayi skin groups. Bess and her brothers and sisters have inherited rights and responsibilities in these places from their father Japaljarri. Mala is the Warlpiri word for the Rufous Hare Wallaby. The Mala became extinct on the Australian mainland surviving only on Bernier and Dorre Islands off Shark Bay in WA. The last colony in the Tanami Desert died out in 1991, after Warlpiri people moved off the land and into settlements like Yuendumu and Lajamanu and no longer practiced traditional burning of their country. Mala had thrived where controlled burning produced mosaics of vegetation at different stages of growth and regrowth. Introduced predators like cats and foxes also reduced their numbers. The nocturnal Mala dug burrows in the spinifex country so was also called wangku-ngawurrpa or 'nest dweller'. It was a popular source of meat, though difficult to hunt because it moved very fast in a zig-zag pattern when it was startled. The Mala has been reintroduced to enclosures in the Uluru-Katatjuta and Watarrka National Parks. The Mala Dreaming (Jukurrpa) track relating to these paintings began at a place called Mawurrungu in the flat sand and salt lake country to the south-west of Yuendumu and west of Lake Bennett. From there the Mala Ancestors travelled northwards. The important sites on this track are also associated with water. There are seven small rock holes at Mawurrungu. Malawirri was one important place where they stopped, rested and then performed ceremonies. Wirri means flood out, flood way or swamp in Warlpiri. As they danced they created the swamp at Malawirri near Jila (Chilla) which means 'spring' in Warlpiri. This swamp feeds into the creek that crosses the Tanami Highway at Chilla Well about 120 kilometres south of The Granites and 140 kilometres north-west of Yuendumu. The spiritual essence and power of the dancing Mala was left behind in the termite mounds (mingkirri) in the flat swampy country at that place. After Malawirri they travelled north through the country to the east of The Granites to finally go underground at Lake Buck about 80 kilometres north east of Tanami.